Gene is a heredity unit of life at a molecular level. It represents a specific set of nucleosides at a particular region/locus on the DNA[1,2]. Each trait that appears in an individual is representative of a particular gene or set of genes. Usually, the traits are represented by polygenes (multiple genes). Genetic traits are of different types like some are easily visible like skin color, hair color, height, eye color, etc while others are not very visible e.g. blood groups, different biochemical components responsible for maintenance of life etc. A slight variation/mutation leads to a different form of a gene for the same trait and these variant forms of a gene are called alleles. Alleles are responsible for different variants of a same trait as the protein coded by them slightly vary from each other e.g. there are many variations in the eye color or skin color of humans. Same genes are involved in the representation of these colors but they compromise of different alleles which result in different phenotypic appearances. With new developments in science on daily basis, the definitions are also refined. New discoveries lead to new conclusions and concepts. Mostly the genes are loci in DNA but some viruses have the genome of RNA so their genes comprise of loci in genomic RNA. Therefore now we can define a gene as a specific locus or set of loci on the genomic sequence for an organism (which may be DNA or RNA) resulting in the production of specific protein[3,4]. The amount of DNA in an organism does not show its number of genes. Most of the DNA in an individual is non-coding. Only a small proportion of the genome is comprised of genes. The smallest genome of any organism (a virus) is comprised of just 2 genes that codes for only 2 functional proteins. Eukaryotes particularly plants have big genomes like the genome of rice is made of almost more than 46000 genes that code for proteins. It is estimated that on the earth the total number of genes that actually translates into proteins is about 5 million . 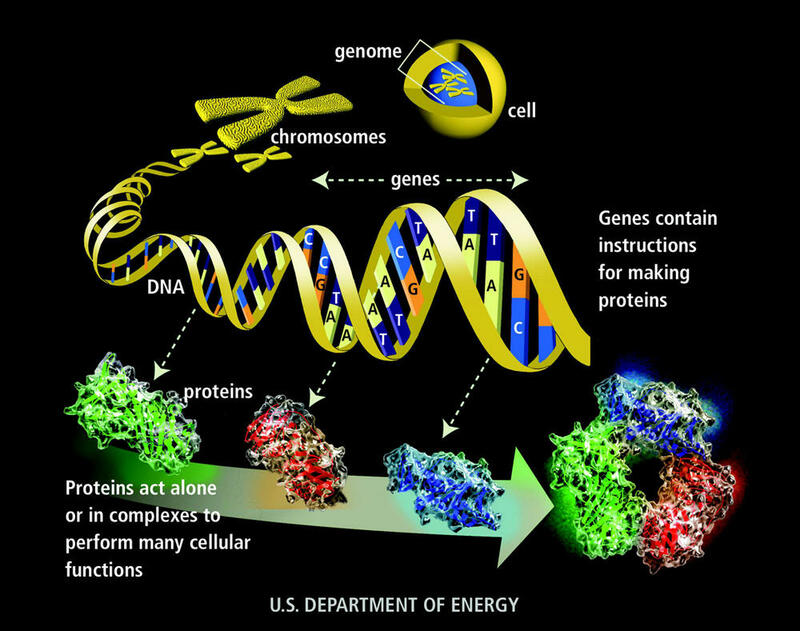 The main function of a gene is the production of a specific protein. First, in this process DNA is transcribed into mRNA which is then translated into proteins. Proteins are composed of 20 different types of amino acids that are linked one by one to each other in the process of translation. Each amino acid is coded by a codon (triplet of ribonucleotides). Usually, a full-length gene is not transcribed into mRNA. 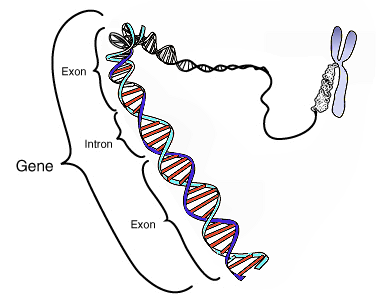 A full-length gene is composed of coding (exons) and non-coding sequences (introns). 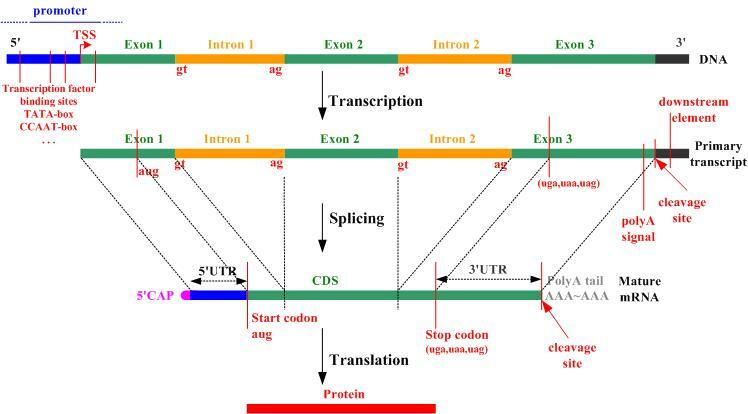 Exons transcribe into mRNA while introns are usually regulatory sequences. Upstream of an ORF (open reading frame) a promoter sequence is present where transcription factors bind to the DNA and transcription is initiated by RNA polymerase[1,2].Promoters may be strong or weak resulting in high or poor efficiency. The genes that need transcription more frequently or need a higher number or mRNA transcribes usually have strong promotes while the less frequently transcribed genes or the genes that need low copy number of mRNAs have weak promoters. The prokaryotic promoters are easy to identify as compared to complex eukaryotic promoters. In addition of promoters many genes have regulatory sequences upstream or down stream of an ORF. This freshly transcribed pre mRNA comprise of the following parts i.e. Ribosome binding site, a start codon, stop codon and terminator. 35 Finally the mRNA is translated into a protein. Codons (trinucleotide sequence of mRNA) are read by complimentary sequences on ribosomal RNA and based on that sequence a specific amino acid is attached. One by one amino acid are linked to each other and a string of amino acids is built which then folds into a 3-dimensional functional protein. 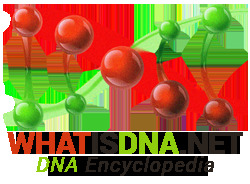 For 20 amino acids 64 codons are available and the specificity of the codon for a particular amino acid is almost universal for all kinds of organisms like eukaryotes, prokaryotes or even viruses . Asexual organisms inherit full genome from their parent. Their genome is exact copy of the parent genome. In sexual organisms, two parents contribute to the full genome of an individual. Half of the genome is from one parent and other half is from other parent. According to Mendelian genetics genes a comprised of 2 alleles. One is dominant and the other is recessive. However now we know that complex genes also exist that result from multiple alleles. For genes with only two alleles the inheritance pattern is quite simple. A single copy of a dominant gene is enough for the phenotypic appearance of that particular trait like color. Absence of dominant gene means two copies of recessive genes which result in the phenotypic expression of a recessive gene . 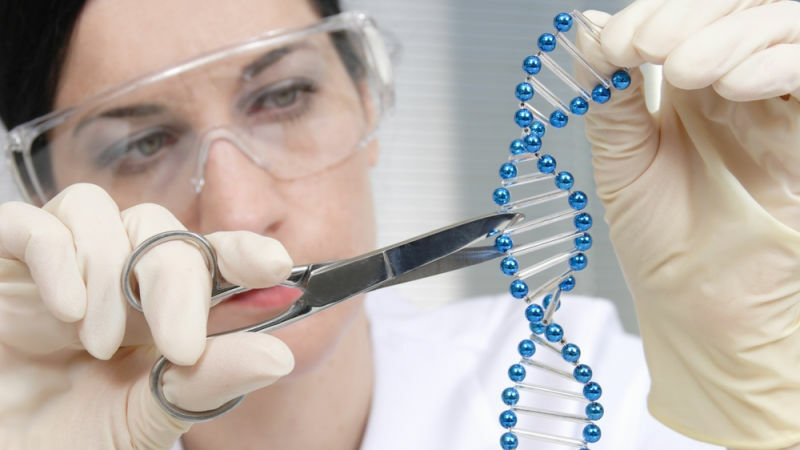 Genetic engineering is the process of modification in the genetic structure of an organism. It is done for different purposes like industrial production of different proteins, to find cure of diseases, medicinal development, agricultural enhancements etc. It may involve addition, subtraction or modification or particular nucleotides are specified locations in the genome. The embryos can be genetically modified which result in genetically modified organisms. Techniques known as gene therapies can be used for the treatments of genetic disorders. Many human diseases are under clinical trials for the treatment by the use of genetic engineering and hopefully soon be available for public use. Alberts B, Johnson A, Lewis J, Raff M, Roberts K, Walter P(2002). Molecular Biology of the Cell(Fourth ed.). New York: Garland Science. Gericke, Niklas Markus; Hagberg, Mariana (5 December 2006). “Definition of historical models of gene function and their relation to students’ understanding of genetics”. Science & Education. 16(7–8): 849–881. Pearson H (May 2006). “Genetics: what is a gene?”. Nature. 441(7092): 398–401. Perez-Iratxeta C, Palidwor G, Andrade-Navarro MA (December 2007).“Towards completion of the Earth’s proteome”. EMBO Reports. 8 (12): 1135–1141. Crick, Francis (1962).The genetic code. WH Freeman and Company. Miko, Ilona (2008).“Gregor Mendel and the Principles of Inheritance”.Nature Education Knowledge. SciTable. Nature Publishing Group. 1 (1): 134. What are proteins and what do they do? «» What is mitosis?